Sandilea Court - A B Lynn & Co.
﻿ Sandilea Court is a purpose built development on ground, first and second floor levels comprising 21 completely self-contained flats. Although built during the late sixties, the complex has been newly refurbished (internally) over the last few years, incorporating brand new fully fitted kitchens and bathrooms, all of which are fully tiled. All flats are furnished to the extent of new carpets curtains, light fittings, lounge suites, coffee tables etc.. The fully fitted kitchens include cookers and fridge freezers and plumbing for washing machines, while bedrooms all have new wardrobe suites with matching dressing tables and bedside cabinets, as well as double beds. Most bathrooms have a shower as well as a bath. 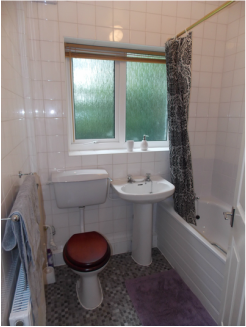 Tenants are also able to enjoy the benefits of central heating and double glazing. The common areas such as entrance hallways are carpeted and brightly lit, some being decorated with potted shrubs or floral arrangements. Every flat has the convenience of its own telephone line and a door entry system, and the development has its own private floodlit car park shrouded by well established trees and evergreens. Garages are optionally available. Rentals vary in price from £92.50 per week for a one bedroomed apartment and from £100.00 for a two bedroomed unit and are paid calendar monthly. There is also a six-monthly service of £100. These figures exclude all outgoings such as electricity, water and telephone charges which the tenant pays directly to the relevant authority. Water rates are presently in the region of £400.00 p.a. and Council Tax is the lowest Band A, at £1,024.00 p.a., reducing to £768.00 p.a. for single occupation. 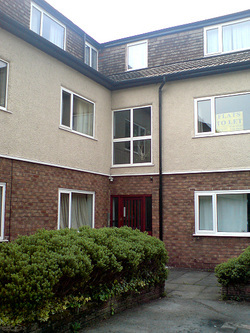 Sandilea Court is situated on the border of Prestwich and Salford M7 3GH just off Moor Lane, which is off Bury New Road, close to Sedgley Park Shopping village. Turn first right off Moor Lane,(immediately after Kersal Moor) into Heathland Road and then second left off Heathland Road into the access road which drops down into the development’s car park. Serviced by a main bus route along Bury New Road, the property is little more than five minute’s drive from the city centre.